"You Put Your Left Foot In..."
Steven (Chicagoland, United States) on 20 April 2010 in Animal & Insect and Portfolio. Not exactly an earth-shattering capture, but I thought it would make a nice inaugural "Silly Tuesday" entry. Birds were spotted playing chicken with the ocean waves along the shoreline of Fort Myers Beach, Florida. At first glance, it looked like all of the birds were in synch with their legs stepping forward. Hahaha nice capture, so funny :) Happy ST Steven ! : ) Your title made my day ! Superbe photo avec un très bon cadrage. En outre, les oiseaux sont magnifiques. Je te souhaite de passer une très bonne soirée. 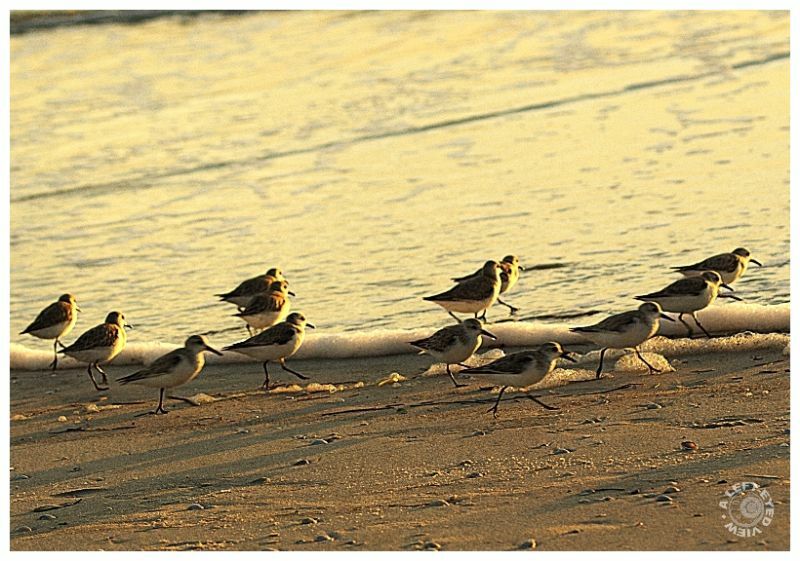 I really like how the birds are running across the beach bathed in the beautiful golden light. Great capture. Hokey-Pokey rides again! I like! I've seen them running in unison... cool. A very cool shot. I like it a lot. That is funny, they are scattering, just ahead of the wave.